The Oxford Stage Company commissioned three musicals for young people with book and lyrics by Renata Allen and music by Howard Goodall from 1989 to 1991. 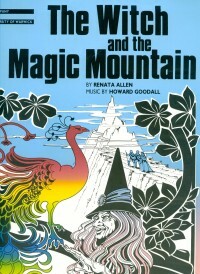 The Witch and the Magic Mountain (1989) – première Warwick Arts Centre. Directed by John Retallack, designed by Julian McGowan, starring Andrew Fairlie, Jan Alphonse, Clive Duncan, Mark Lloyd, Carol Russell, Christopher Ashley. The Princess and the Monkey Palace (1990) première Warwick Arts Centre. Directed by Martin Jameson, designed by Ruari Murchison, movement by Roger Ennals, starring Lorraine Brunning, Joe Hall, Maureen Marsh, Luke Sibley, Mark Hollander, Angela Lloyd, musical director Gary Williams. The Magic Storybook (1991) – première Oxford Playhouse. Directed by John Retallack, designed by Kathy Strachan, choreography Eusebia, mime coach Clive Duncan, movement Ben Benison; starring Clive Duncan, Andrew Dennis, Penelope Dimond, Carol Redford, Nicola Burnett Smith, Jan Alphonse and Karl James, musical director Juliet E Hill. Two reviews of this production can be found here.